The scarlet red of the spawning Kokanee Salmon as they come home to spawn is an amazing sight. These land-locked Sockeye Salmon are not only an iconic species in the Kootenays, they are also a keystone species in their home ecosystems; other species in that ecosystem rely on a keystone species. But we have lost some stocks of these beautiful fish in Kootenay Lake in recent years. Kokanee Salmon in Kootenay Lake have not gone to the ocean since Bonnington Falls was created by geologic forces after the last glaciation. They are landlocked Sockeye Salmon that live their lives in Kooteney Lake but return to the area where they were spawned when they are 3 or 4 years old. 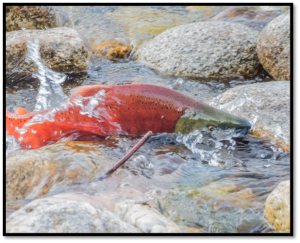 Most people may realize that Kokanee Salmon spawn in creeks and rivers, including spawning channels such as Redfish and Kokanee Creek spawning channels in the fall. But in the past 16 years, officials have been more aware that there is a separate stock of Kokanee Salmon that spawn in the ground waters on some stony shores on the West Arm of Kootenay Lake. These “shore-spawners” may be a genetically distinct stock of Kokanee Salmon, but we do know that they spawn later in fall and their fry may emerge earlier from the nests (redds) in spring than the creek spawners. Long-time residents remember shoveling the carcasses of the dead shore-spawners (Kokanee Salmon die after spawning) into their gardens for fertilizer. The shore-spawners are no longer that numerous, but they are still making their redds every fall on the West Arm. It is unknown how the shore-spawners contributed to Kokanee Salmon populations before the dams were built, but they are still around and still spawning on the shores of the west arm: but they require the water levels cover their redds as they spawn and while the fry emerge from the redds. The water levels of the dammed Kootenay Lake are managed over the year to prevent flooding, to manage for sturgeon and for other reasons on both sides of the border. Last year the water level was drawn down on the west arm to make it easier for the Kokanee Salmon shore-spawners to make their nests lower on the beaches. However, the water levels in spring are even lower than in fall which means that the Kokanee fry emerging from many of the redds cannot swim to the lake. They are left high and dry. The fry require very little water to make it to the lake, but they do require water to keep the redds wet and to swim to the lake. At least two sources indicate that while the water level this spring is low, it is not uncommon for the water level to be this low. Loss of many of the shore-spawning Kokanee fry is then not an unusual event confined to abnormally low level years. It may be a common occurrence. Shore-spawner redds were surveyed in the fall of 2018 by Fish and Wildlife on seven active shore-spawning sites on the west arm of Kootenay Lake. A total of 968 redds were found. This number indicates that there were at least 2,000 shore-spawners at these sites – producing perhaps 500 eggs in each redd. This spring, with the knowledge and permission of Fish and Wildlife biologists, we checked on two sites of these sites on the West Arm to see how the emerging fry were faring. On March 24 of 2019 we visited the redds and found the fry had no remains of the yolk pouch of the alevin (the stage that emerges from the egg and that becomes the fry) and were ready to go to the lake. We found live fry in damp redds, some damp and some dried up redds. These redds were an average of 2.5 m from the lake. On a second visit to these redds on April 4 we found live fry, dead fry and dried up nests – all well above the water level. These fry in videos cannot make it to the lake. Why are these shore-spawning Kokanee Salmon important? Yes, they are a keystone species, and yes they are an iconic cultural symbol but they are also survivors. They have survived the crash of other Kokanee Salmon stocks and they are still fighting to survive despite water levels that do not support the survival of their eggs and fry. We may lose more salmon stocks if yearly temperature averages continue to increase (as predicted) in the future. Salmon are cold-water fish. Temperatures above 15 degrees Celsius can be fatal to these fish. The creeks and rivers will warm faster than the lake and we may lose many of the creek-spawners in the future. But the lake will warm slower. Perhaps these shore-spawning Kokanee Salmon may survive in Kootenay Lake longer than other stocks. Who knows? But we should try to keep them around as long as we can. “All” we need to do is make sure that for three or so weeks in March they have enough water to cover their nests (maybe 6” is enough). It is not that simple. There are complications and important reasons for lake level fluctuations. But we have already lost some Kokanee Salmon stocks. If we could go back and find a way to prevent that loss, we probably would. We may still be able to help these shore-spawning Kokanee Salmon survive well into the future. We should at least try.